Life can’t be all trackdays, but the 959 devours A-roads too. How else do you eat breakfast when there’s a Panigale begging to be ridden? With the 959 there’s no difficulty getting 'noise test pass' sticker. Inner city commute? Sod that, time to find some back roads. As the track dries it’s time to switch back into Race mode. It’s utterly intoxicating. Typical, you book a trackday and the weather switches from sun to dismal drizzle. Snetterton’s surface is glassy with moisture, time to switch to Rain mode with softer power and more traction control. When it outgrew World Supersport in 2008, Ducati’s smaller superbike was free to develop into an almost perfect road-going sportsbike. No longer a poor relation to the top-flight Ducati superbike, the 848 was a stunning machine in its own right. The ideal blend of power, low-down torque, handling and beauty, it treated performance-loving road riders to an involved, totally analogue, mechanical riding experience, and left the high-tech gizmos and punishing power to its range-topping bigger brother. But time has a habit of making things expand and, like so many waistlines, Ducati’s ‘small’ superbike isn’t so little anymore. Just as 749cc grew to 849cc, in the past three years 849cc has swelled to 898cc, and now tips the dial gauge at 955cc in the new 959 Panigale. Ducati’s ‘Super-Mid’ superbike is now larger in capacity than the original 916, packs almost as much technology as the firm’s top-of-the-range 1299, and costs about the same as a Japanese litre sportsbike. Then there’s the matter of the imminent arrival of Ducati’s 2017 939 SuperSport, a whole new breed of road-biased sportsbike. 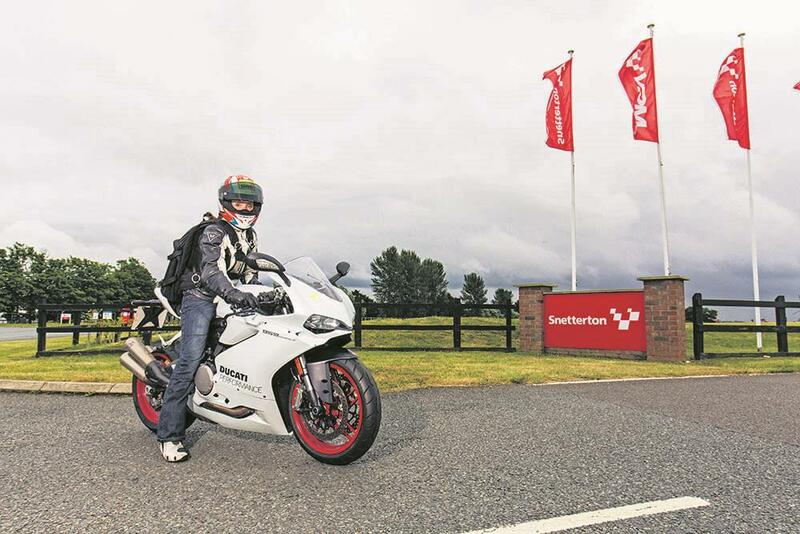 So it begs the question, is there still a place for the midi-superbike in Britain’s Ducati dealerships? 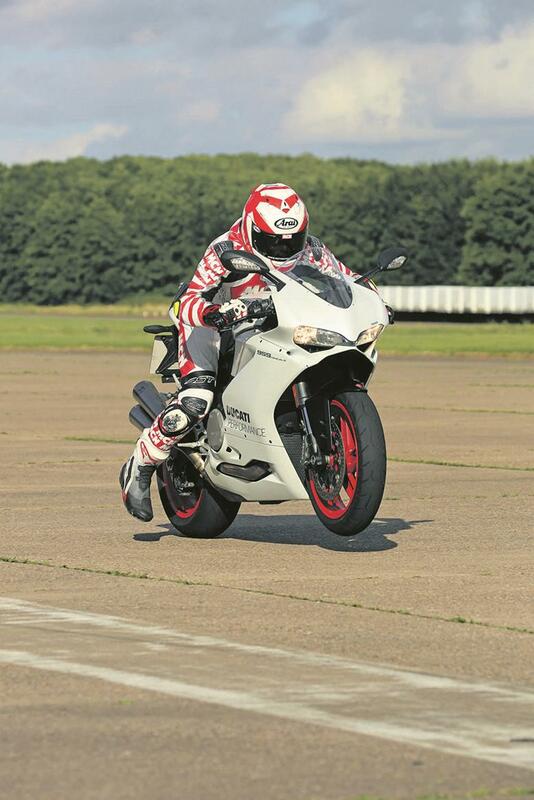 MCN spent a week with the £13,295 959 Panigale to find out. Superquadro V-twin, just wants to rev and there’s nowhere near as much bottom end as I was expecting. Caged by traffic the 959 feels tight and frantic, its at-the-wheel 144bhp is all het up with nowhere to go. At sub 40mph speeds with no windblast to support me, I’m having to prop myself up by leaning my left arm on the tank, and throttling off is like hitting a brick wall, slamming my bodyweight further forward still. It’s a small mercy that the slipper clutch with its self-servo mechanism makes the lever action super light, while the part-throttle fuel injection via the twin-injector bodies is impressively smooth. But this ease of operation doesn’t do anything to quell the fire that’s raging beneath me. The traffic’s building and the heat’s rising, the Panigale’s temperature gauge is now into triple figures and the cooling fan’s still not kicked in. My thigh is sizzling next to the coiled-up exhaust header beneath the seat. This isn’t fun, this is torture. Yet, once at home with the garage door closed behind me, standing and staring at the baby Pani’s glowering headlamps and perfect pearlescent paint, all that pain’s somehow forgotten. Fitted with the optional-extra Akra slip-on I can even forgive it that questionable exhaust. This feels like love, this is Ducati sportsbike ownership. Eyes open hours before the alarm, pupils dilating as the thought of the 959 Panigale waiting in the garage spikes my bloodstream with endorphins. Early morning traffic-free roads are an opportunity not to be missed and offer the 959 a chance to show me what it’s really made of. Straight into leathers, quick cup of tea, then out of the front door for a pre-work buzz that’s better than a triple espresso. On deserted country B-roads the 959 comes into its own. 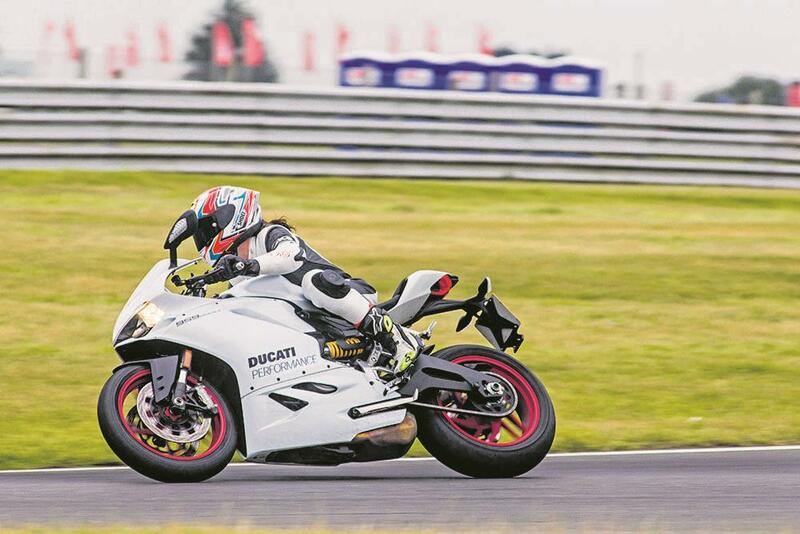 Winding the throttle back from part-closed to fully open, the induction note changes as the Panigale gulps in the still morning air before the 955cc V-twin combusts it into cacophonous chaos. Euro4 might’ve dampened the Ducati’s mechanical noise via sound-deadening fairings, ribbed cam covers and those contentious shot gun-style cans, but they’ve cleverly made up for it in other areas. The howl of tortured air resonates within the aluminium monocoque chassis airbox and ricochets off sleepy cottages, rousing those who live their lives in the decidedly slower lane. With the sun only a few hours old I remind myself that I should be taking it easy on the cool early morning tarmac, so I close the throttle and lower the pre-set rider mode from Race to Sport, softening the response and increasing the traction control and ABS intervention. But the feel from the rear end is sublime enough not to need electronic assistance, the 4mm lower-than-before swingarm pivot helping generate an almost supernatural connection with the rear Pirelli. The 959 flits between corners like a mayfly, effortless and resistance free. 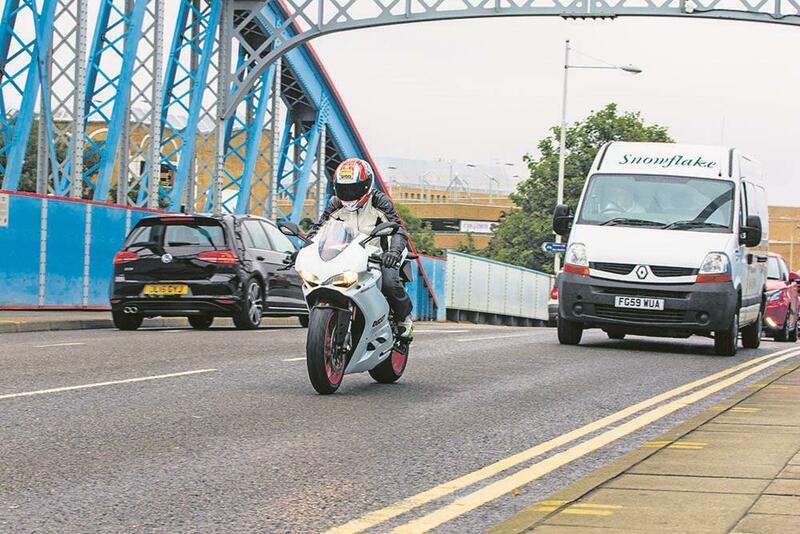 Those Euro4 regulations might have added an extra 7kg to the smaller Panigale’s wet weight, making it heavier than 200bhp superbikes like BMW’s S1000RR or Kawasaki’s ZX-10R, but you’d never guess. It’s a marvel of packaging and weight distribution. Either side of that work-of-art top yoke and gripping a pair of Showa Big Piston Fork tubes, the Pani’s wide-set bars are giving me ultimate control, like a rodeo rider holding on to a little white bull. Which on these bumpy country lanes, and with the Ducati-typical rigid rear Sachs suspension, is a fair description of how the ride feels. But that’s to be expected, this is a thoroughbred being galloped down lanes more suited to a donkey. lubricating the Snetterton track surface just enough to turn it into greased glass. Fitted with Pirelli’s awesome fast-road Diablo Rosso II tyres I thought the 959 Panigale would shrug off the inclement conditions, but instead we just squirmed, fishtailed and two-wheel drifted into and around Snett’s bends. 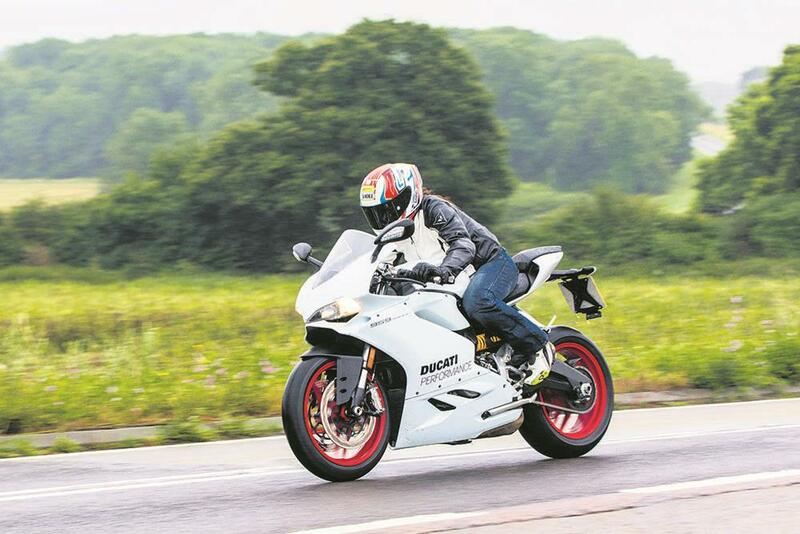 Unlike the 1299 Panigale, there’s no cornering ABS on the 959 – Ducati have to save some prestige for their range-topping superbike – but in conditions like this it would be really comforting to have. 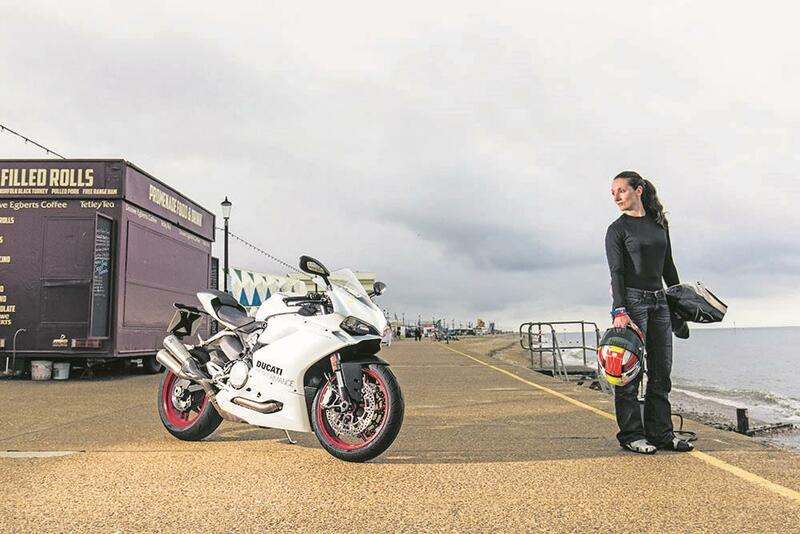 A dry-enough line develops for me to at least revert back into Race mode then slingshot around the third-gear right-hander onto the Bentley straight, the Panigale’s useable 74ftlb of torque and velvet-smooth delivery giving me the confidence to pin the throttle at the apex. I fold myself down behind the screen; my now horizontal forearms slotting perfectly into the sides of the Pani’s sculpted tank, its ride-by-wire throttle open wide as the digits on the digital dash spiral upwards. Bike and rider are as one as the 959 gluttonises the gears I’m spoon-feeding it via the perfect quickshifter. This is utterly intoxicating. A blur of red and booming exhaust to my left snaps me out of my trance, it’s a trackday instructor on his 1299 Panigale. I imagine the rush he must be feeling clinging on to that extra 40 or so bhp, the superbike trying its best to buck him off with every new cog. Exhilarating but hard work. I catch up with him later in the pits to quiz him on his choice of bike, why he opted for the fire-breathing 1299 rather than the smaller, cheaper alternative. That’s all well and good if you spend plenty of time on track, as you would as a trackday regular, instructor or racer, but for those of us whose time on track is precious we have to make sure we can hit the ground running and the easy-to-use 959 definitely allows that to happen. It makes going fast extremely easy, regardless of your skill level. Not to mention the fact that, unlike its under-slung exhausted bigger brothers, it sails through trackday noise tests with ease. It’s a fact that plenty of the world’s sportsbike riders have cottoned on to, because out of the total 9788 Panigales sold in 2015, 5806 of them were the smaller 899 version. Less sometimes really is more. Despite my soggy socks, I decide to take the long way home via the north Norfolk coast and Hunstanton for a celebratory cup of tea as the sun goes down. My joy tainted only by the fact that after 300 miles in the saddle, I’ve just had to stop for petrol for the third time that day. Thirty eight miles per gallon and a supposed 17-litre fuel tank that somehow only takes 11 litres makes for an annoying 91 miles before the fuel light comes on. As is often the case with Ducatis, the reserve light is desperately nervous, and comes on way too early. With my week with the 959 Panigale coming to a close, there’s still one question floating around in my head: where does the mid-sized Ducati sportster fit in? At 955cc it’s now bigger in both capacity and power than the original 916, so it’s no longer a traditional middleweight in the same way as a Suzuki GSX-R750 and Triumph Daytona 675. But retailing at £13,295 it costs about the same as a Japanese litre bike, like a Fireblade SP. So how does it compare in terms of performance? 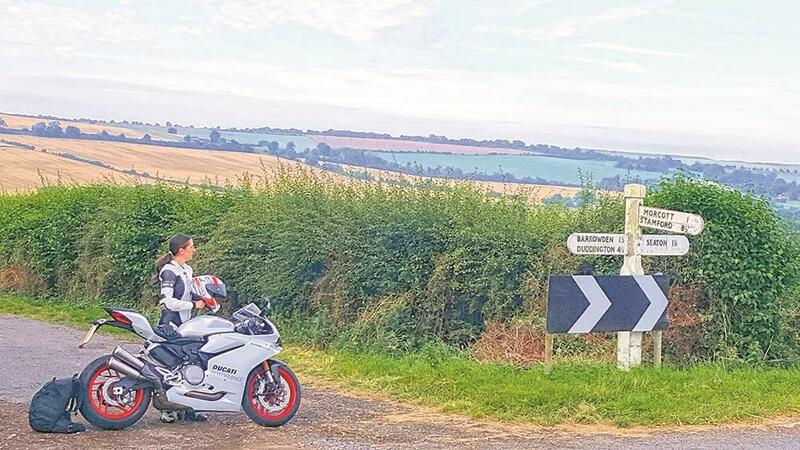 A quick blast to Bruningthorpe Proving Ground would test the 959’s mettle, and for reference I took along its older (but now smaller) brother the 1996 Ducati 916 SP, as well as Honda’s range-topping superbike. Incredibly, despite being 20 years newer and boasting a 39cc capacity advantage with at least 40bhp more power, the 959 Panigale can only match the Ducati 916 SP’s 0-60mph time of 3.62s. 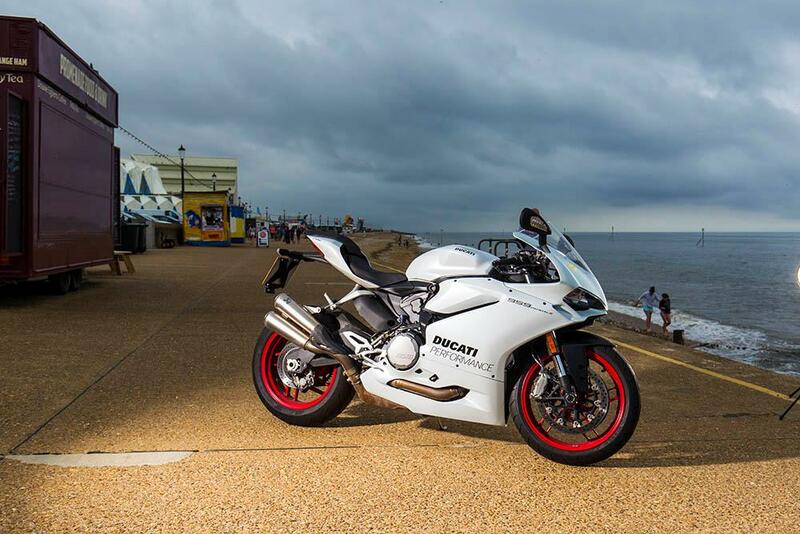 The Panigale gets into its stride higher up the speed range, pipping the 916 to 100mph by 0.2s before topping out at a GPS-verified 172.8mph. The 916 hits its limiter at 166.91mph. 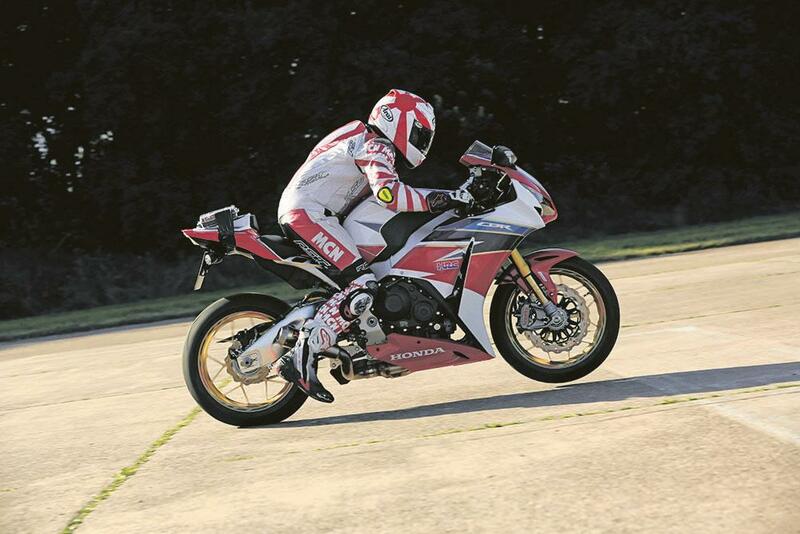 When it came to the four-cylinder might of the Fireblade, both Ducatis are taken to task in straight-line and top-speed performance tests, with the Blade taking just 5.7s to reach 100mph before topping out at 179mph. 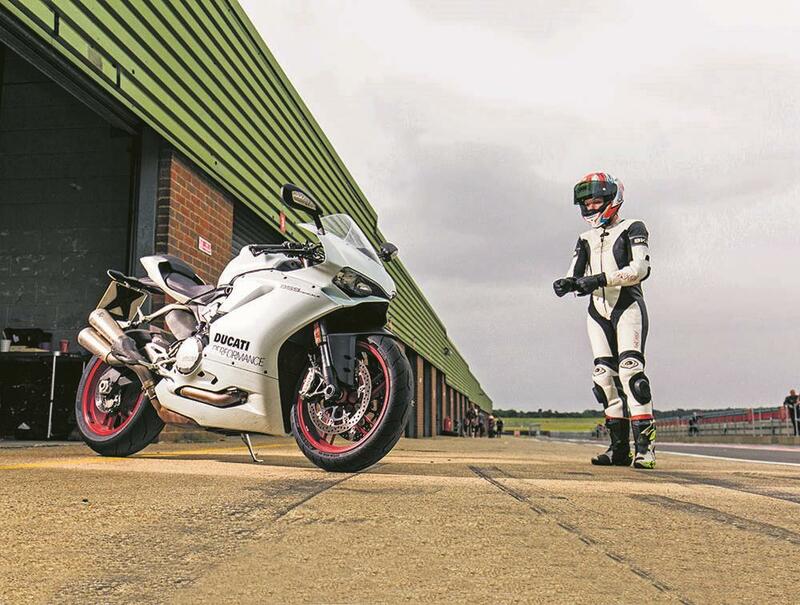 However, for all the Blade’s power advantage, earlier this year MCN discovered that the sweet-handling 959 Panigale could lap a tight, twisty track a whopping 1.5 seconds quicker than the Japanese machine, proof of its superior handling and high corner speed-inspiring ride. The 959 Panigale’s got that X-factor; the mysterious particle floating around in its molecular structure that just can’t be quantified; a strange by-product of its supernatural side-of-tyre stability, fast but useable engine, exotic beauty and all the latest electronic bells and whistles. More agile and technologically advanced than a Fireblade, the 959 Panigale trumps both the Japanese bike and its older 916 brother when it comes to maintenance too, amazingly only requiring servicing every 7500 miles, with a valve inspection coming at 15,000 – double that of the Fireblade and 916. Incredible considering how hard it revs and how racy it feels. The 959 ticks all the boxes without making you feel like you’re settling for second best, a fact that’s reinforced by the smaller Panigale accounting for 59% of the Ducati superbike family’s worldwide sales. Sublime on the road, devastating on track and a heartbreaker in the garage, it’s the full package. Just don’t ride it slowly through town on a hot summer’s day, for that you’ll need to wait for next year’s 939 SuperSport or buy a pair of asbestos underpants. Life can’t be all trackdays, but the 959 devours A-roads too. How else do you eat breakfast when there’s a Panigale begging to be ridden? 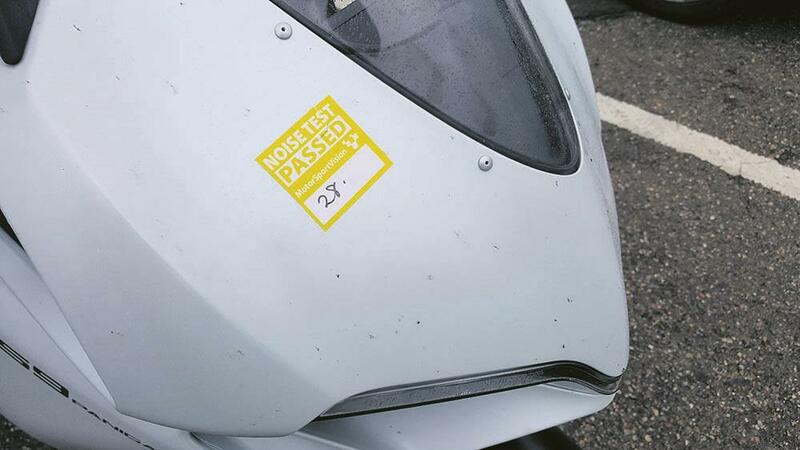 With the 959 there’s no difficulty getting 'noise test pass' sticker. Inner city commute? Sod that, time to find some back roads. Noise testing is always a worrying pre-trackday moment… As the track dries it’s time to switch back into Race mode. It’s utterly intoxicating. Typical, you book a trackday and the weather switches from sun to dismal drizzle. 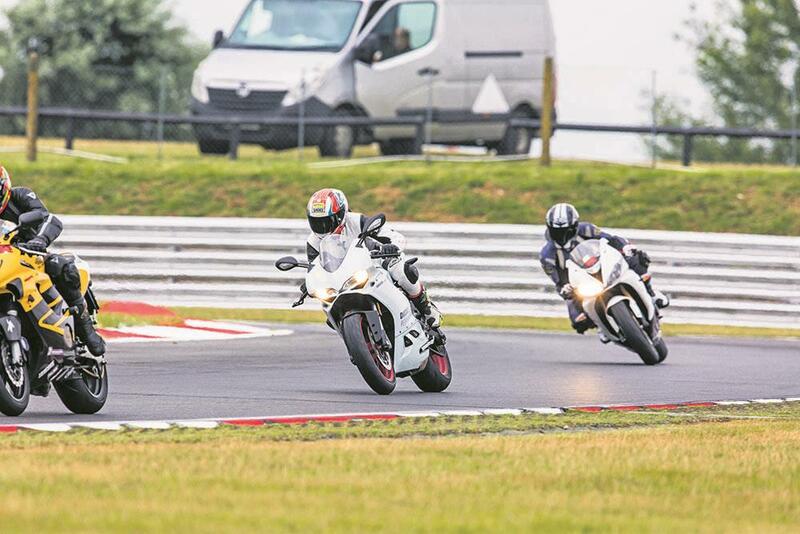 ‘Watch out for seagulls, I’m off to grab myself a cuppa’ Snetterton’s surface is glassy with moisture, time to switch to Rain mode with softer power and more traction control.